[F]rom the American Occupy movement to the surprise best-seller by the economist Thomas Piketty, income inequality is all the rage—perhaps because it’s raging. According to a newly released study, the last few decades have seen a rise of the biggest income gaps within nations since the Industrial Revolution. There’s certainly good news in here: life expectancy has gone from 30 to 70; worldwide literacy rates have risen; we’ve even gotten taller. But while overall well-being is on the rise, there’s one metric that was once improving and has now regressed pretty hard. “It is hard not to notice the sharp increase in income inequality experienced by the vast majority of countries from the 1980s,” the study states. In the spirit of remembering exceptions, it’s worth noting that South Africa has actually become more equal since then, but that’s largely explained by South Africa in the 1970s having the highest inequality in the entire study. The study found that during the 20th century, the gap between relative incomes of countries grew wider, but within countries income became more equal, until around the ’70s. 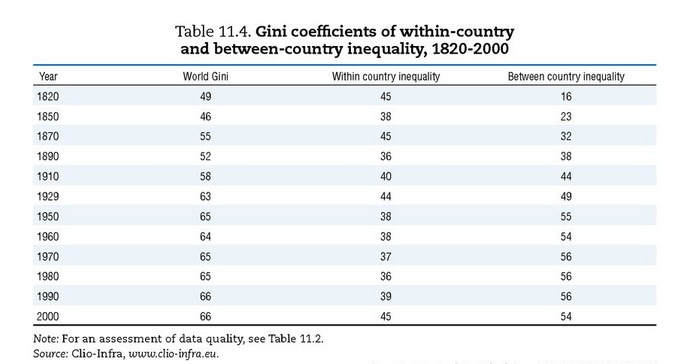 Following the collapse of the Soviet Union income inequality climbed in Eastern Europe. Income inequality in China rose too. Globalization, the study finds, has the curious effect of making nations more equal relative to each other, but making the residents of the nations less equal relative to each other. To the Piketty reader, none of this is a surprise. You can disagree about what drives inequality—or disagree that a widening income gap is a problem—but it’s hard to ignore the dramatic shift. Posted in CORPORADOES, GLOBALIZATION/PRIVATIZATION, GUEST AUTHOR, HISTORY, INEQUALITY, LIFE UNDER CAPITALISM, PLUTOCRATIC POWER, THE WORLD.